Flackery Magazine Ads - DEADLINE 5:00PM Friday, May 3rd! Use this form to upload ad content and graphics. You are welcome to submit prebuilt ads, but it is not necessary. If you want me to build the ad for you, you must submit whatever text, graphics, etc... you want to be included in the ad. We print limited copies of the magazine so ad graphics must be 300 dpi and CMYK color. Flackery offers very competitive rates for standard digital display ads. 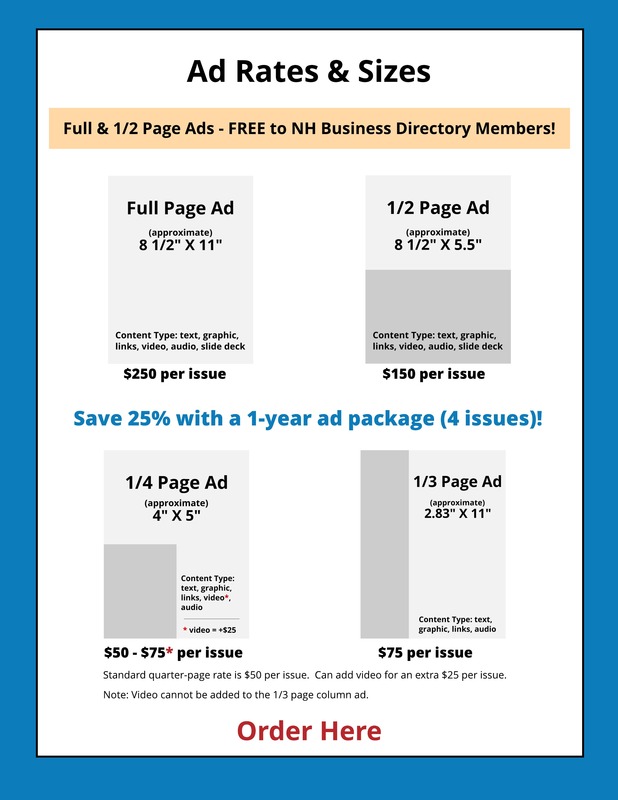 NOTE: Ads for NH Business Directory members are always free, no matter the size or content. NOTE: This form is for ad content only. If you wish to submit blog posts or video content for this issue, please use the separate Content Upload Form. DEADLINE: All ads and ad content must be received by 5:00 PM Friday, May 3rd to be included in this quarter's magazine. NOTE: This section will not appear in your ad. If you have a completed, print-ready ad you wish to place in the NH Business Directory magazine, skip to the bottom and use the upload form. If you don't have a print-ready ad, I am happy to build one for you, but I'm going to need some info from you. Please put any text or ad copy you wish to be included in your ad in the Ad Copy/Text input box. Graphics for coupons, logos, etc... should be uploaded through the Graphic Upload form at the bottom. Video: If you wish to include video in your ad, please paste the URL or iframe content in the video box. If you have any questions you can leave me a message in the Notes box below or reach me directly by email, buzz@queencity.buzz, or phone 603-264-0788. The publisher retains the right to reject or cancel any ad or content that does not in keeping with publication's standards. Advertisers and contributors will assume liability for all contents including text, representation and illustrations of advertising or submitted content and also assume responsibility for any claims arising therefrom against the publisher. The publisher also reserves the right to place the word "Advertisement" or "Sponsored Content" on ads or article content, which in the publisher's opinion, appears to be an advertisement or editorial content. Flackery digital magazine is meant to be an informational marketing vehicle for participating members and contributors. The quality of the content is a reflection on Queen City Buzz, NH Business Directory, directory members and contributors. This form is for ad upload only -- You will not be invoiced until your ad is approved by the publisher. All ads must be paid in full to be included in the publication. IMPORTANT: We are on a strict deadline please DO NOT MESSAGE me on Facebook or LinkedIn as I only check those platforms once a day.